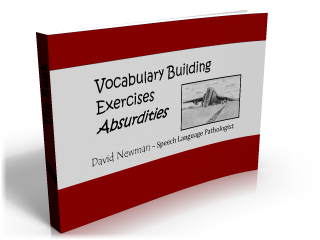 Activities for Teaching Vocabulary: The vocabulary building exercises on this free download were specifically designed by a language arts expert to improve your students' oral vocabulary, listening comprehension, and thinking skills. The vocabulary builders target your students' oral receptive and expressive language skills. The exercises use time-tested techniques to focus your students' ability to listen and respond to absurd situations, and explore the reasons as to why the situation is absurd and could not exist in real life. It's in the probing and analysis of why the situations are absurd that provide much rich and meaningful oral language explorations. The vocabulary building program features over 100 individual scenarios, which cleverly distort common everyday situations. Each scenario contains several questions to further prompt your students' lateral thinking skills. Biemiller,, A. (2003). Vocabulary: Needed if more children are to read well. Reading Psychology, 24, 323-335.